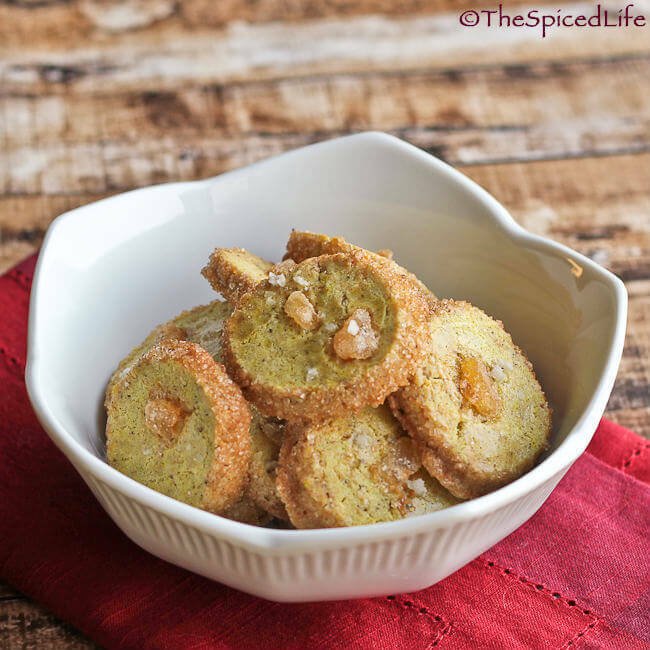 Unexpectedly delicious, Ginger Curry Sugar Cookies are a unique twist on slice and bake butter sugar cookies. Keep reading for more Creative Cookie Exchange ginger deliciousness. A copy of Sugar Rush was provided to me by Blogging for Books in exchange for an honest review. Affiliate links were used in this post to link to items I am discussing. I was not sure what to expect from Johnny Iuzzini’s Sugar Rush: Master Tips, Techniques, and Recipes for Sweet Baking — I knew it would be gorgeous and drool-worthy, but I was not sure how user friendly it would be. In other words, would it be geared to the home baker or would it be restaurant style desserts to make at home? I am happy to report that while the flavors are sophisticated, there is much in here to attract home bakers like myself, who enjoy just making cookies, cakes, muffins, etc. And yes the pictures are gorgeous—of food and baker alike! I had a hard time settling on a recipe—from wealth, not dearth, of choices. The recipe I am most intrigued by, the Rich Butter Cookies with Pink Peppercorns and Sea Salt, required hard boiled yolks, and while that was the only fussy thing about the recipe, it was too fussy for me right now. I was completely enthused about the Zucchini and Roasted Corn Muffins, but felt like I was about a month late to make those—maybe definitely next season. His Cottontail Cookies (similar to a wedding cookie) are high on my list for the holidays this year. But in the end, I decided to try these Ginger-Curry Sugar Cookies because I just had to find out if the curry worked or if he was crazy. These cookies are terrific! I used Penzey’s sweet curry powder—and no matter how weird you think these sound, I promise you they work. Both my kids loved them, as did my husband as well. And the candied ginger on top is the perfect complement. Ironically I made these cookies, and then a few days later was wondering what I should make for Creative Cookie Exchange this month. The theme of which (as picked by me) is ginger. And yes it took me a few whole minutes before it occurred to me. Duh! I already have some gorgeous ginger cookies waiting to be shared! I love ginger in the fall—which is of course why I picked it. My cookies used both dried ground ginger and candied ginger, but any kind of ginger was fair game, and I think you will discover some really wonderful ginger cookie recipes if you keep reading down below! Using an electric mixer, beat the butter on a medium low speed until creamy, about 5 minutes. Scrape down the sides and bottom of the bowl and add the egg and vanilla. Beat on medium low speed until combined. While the butter is beating, whisk together the flour, confectioners’ sugar, ground ginger, curry powder and salt. With the mixer on low speed, and after you have mixed in the egg and vanilla, slowly add the flour mixture to the butter and mix until just combined. You may need to scrape down the sides and bottom of the bowl a few times. Divide the dough in half. Roll each half into a log about 1½ inches in diameter. Wrap the log in plastic wrap—roll the log into as cylindrical of a shape as you can without making it skinnier. Place the wrapped logs in the refrigerator and chill until firm (you could also freeze them at this stage for make-ahead dough). When you are ready to bake, preheat the oven to 350 F. Line 2 (if baking all at once) baking sheets with parchment paper or silicone mats. Roll the dough a few times to round out any edges. Brush the beaten egg yolk (or white) over the dough and then roll it thickly in the Demerara sugar. Slice the logs, rotating occasionally, into ¼-inch rounds and place those rounds onto the prepared baking sheets 1 inch apart. 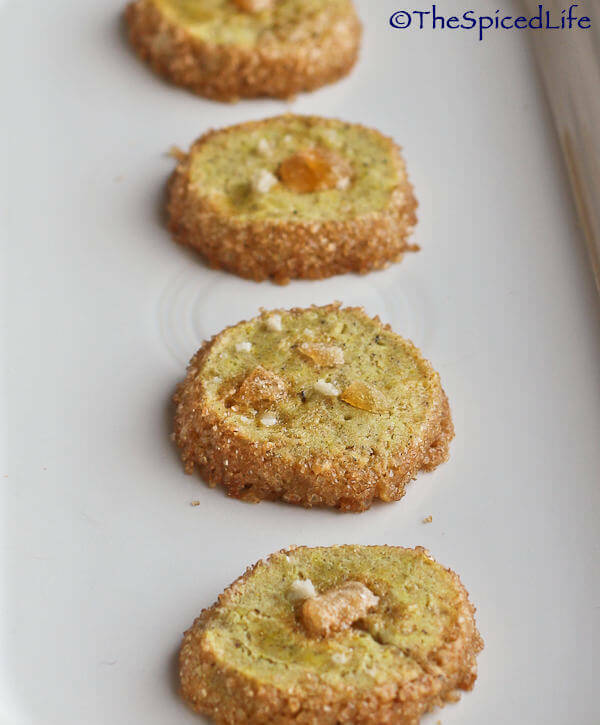 Brush each cookie with the beaten egg yolk (or white) and lightly press 1-3 pieces (depending on size) of candied ginger onto the tops of the cookies. Then sprinkle with the coarse salt. Bake for 14-17 minutes, rotating the pans halfway through front to back and side to side. The cookies are done when the edges are beginning to turn golden. Let cool completely on the cookie sheets. Store in airtight container when cooled. The theme this month is Ginger! Dried and ground, candied, fresh–if you like ginger in your cookies you have come to the right place! 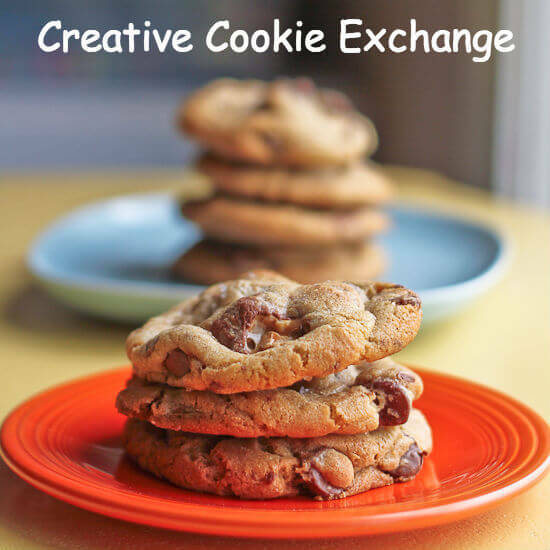 If you are a blogger and want to join in the fun, contact me at thespicedlife AT gmail DOT com and I will get you added to our Facebook group, where we discuss our cookies and share links. Favourite Gingerbread Cookies from What Smells So Good? You’ve really used spices in a special way this month– love the curry and ginger! 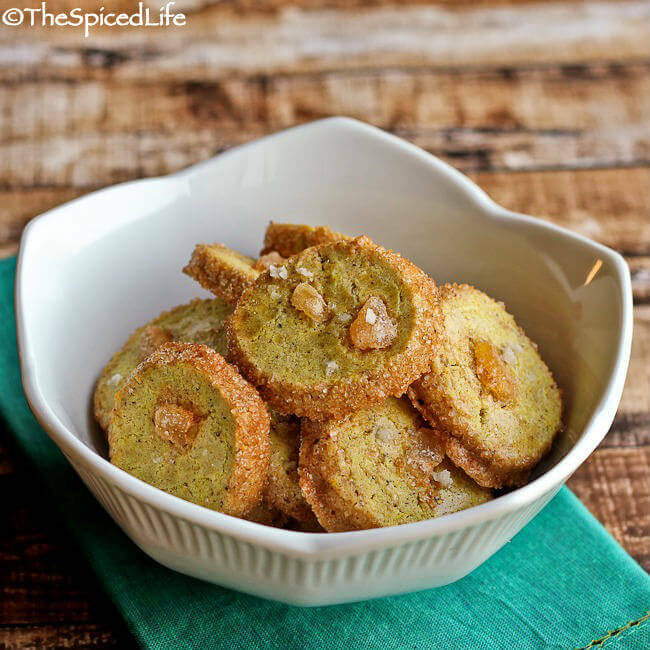 Curry cookies – I’m all over it! This is a must try. These copies of your sound amazing. Ooooh, yum. I love that spicy combination and the beautiful color. As always, gorgeous photos! I just got that cookbook and haven’t baked anything from it yet…but these just moved straight to the top of the list! I love the combination of ginger and curry in savory dishes, Laura, but I intrigued by their use in sweet cookies. Based on the reviews of your taste testers, I need to give these a try! CUrry in a cookie? Interesting! I can’t imagine curry in a cookie, these sound so intriguing. They look great too! What a fun recipe! I love how unique this is!